Hello all! Alison here, from Words and Pictures, ready to get messy with Distress Inks and Distress Paints. 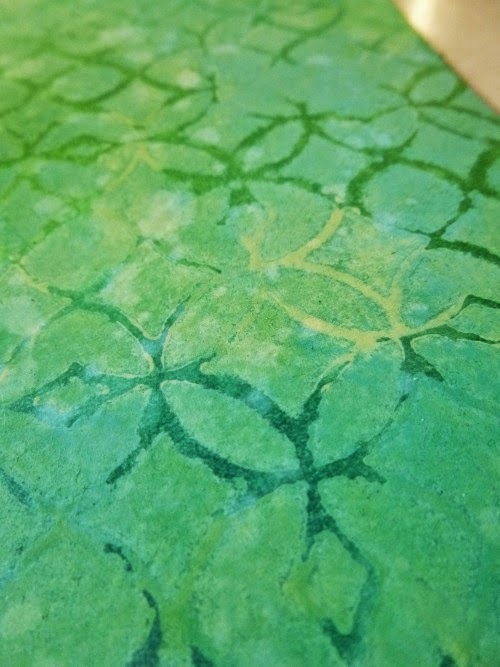 One of my favourite things is to play with the contrast between the translucent inks and opaque paints, so I'm sharing a technique I love. 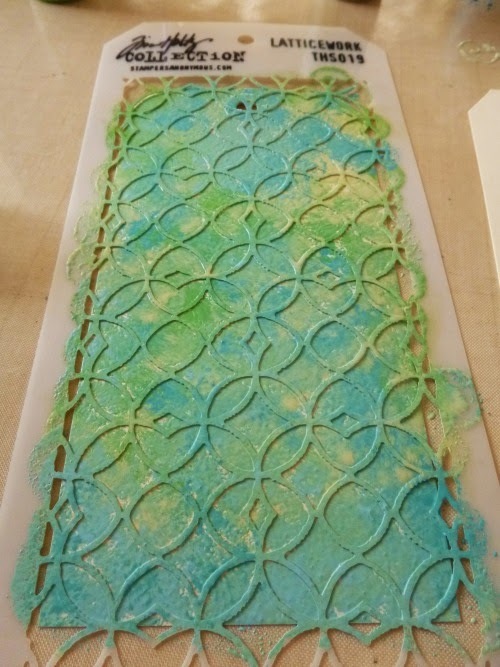 It also uses stencils, so it follows on quite nicely from Jenny's great tutorial last time out. Click on any of the product links if you feel the urge to go shopping over at our generous sponsor, Country View Crafts. I tried out a couple of different ways of applying the paint, and you'll see that each has its pros and cons. Another thing I like is that you always get a pair of backgrounds out of this technique (at least), so you've got twice the play area once you're done. Obviously, you can use any colours you like - I've gone for my blues and greens today. 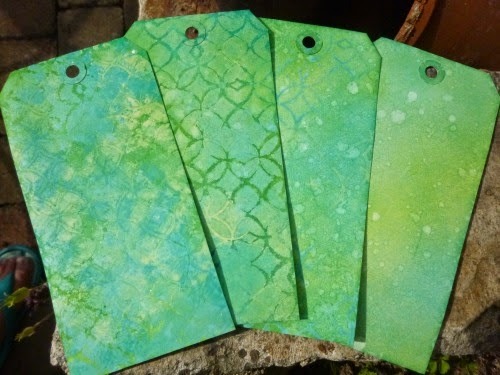 First up, I get both manila tags ready next to one another on the craft mat. 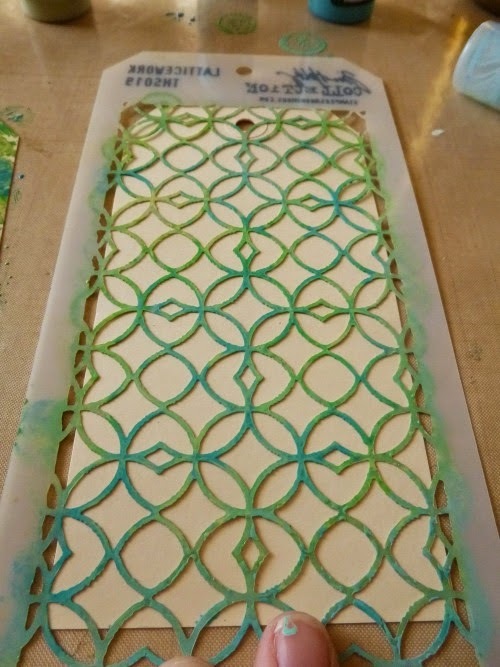 Then I lay down whichever stencil I want to work with - today it's one of Tim Holtz's Layering Stencils, Latticework. For the first go, I applied my Distress Paints direct from the dabber. 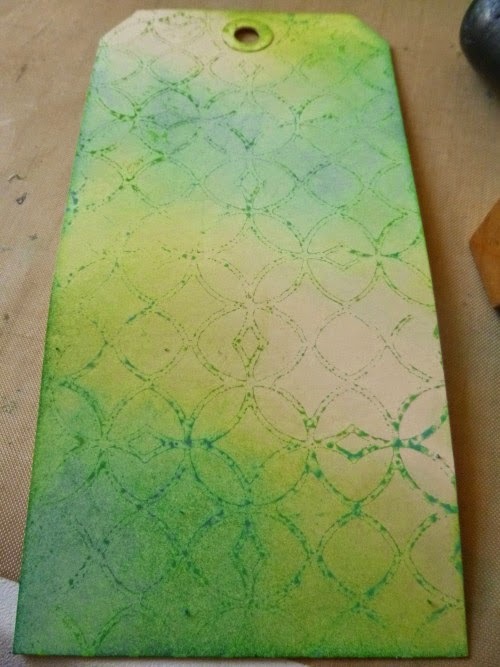 That gets you quite a lot of paint in play, so with a stencil this fine, you won't get a precise, orderly effect. If you work with a more solid stencil, that won't be such an issue. 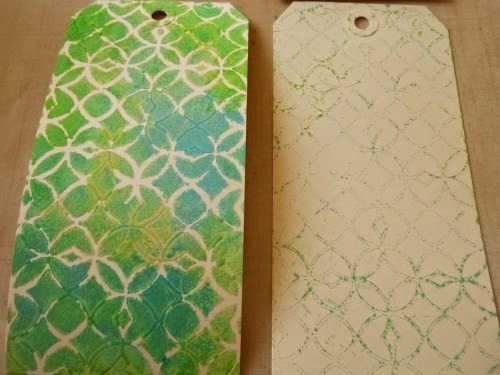 As soon as you've got the tag covered, flip the stencil over onto the second tag, painty side down, and use a cloth or paper towel to press it down onto the tag. Then let them dry, or use a heat tool if you're impatient! I love the effect of that heavy amount of paint on the first tag, but there's not a lot of clear space for inking, so I decided to start up a second pair of tags straight away. 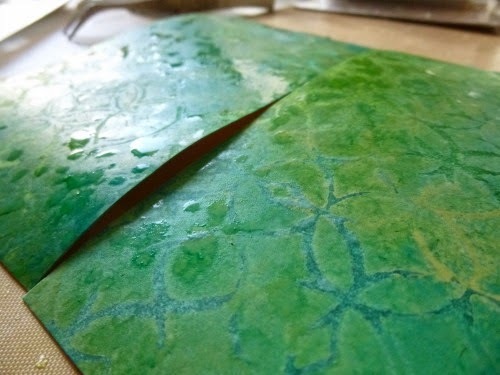 This time, I splodged the Distress Paint on to the craft mat, and then applied it with Cut-n-Dry Foam. You get much less paint on the surface of the tag, so the stencilling is more precise (still with imperfections to be embraced - but that's what I love). But that means there's also less paint on the stencil, so you have to flip it fast and press down to get it onto the second tag. 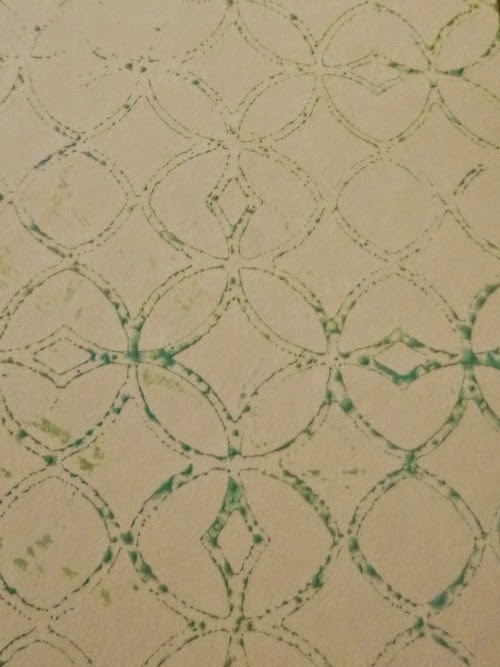 Look what a cool outline effect I got this time from having so little paint on the reverse flip! 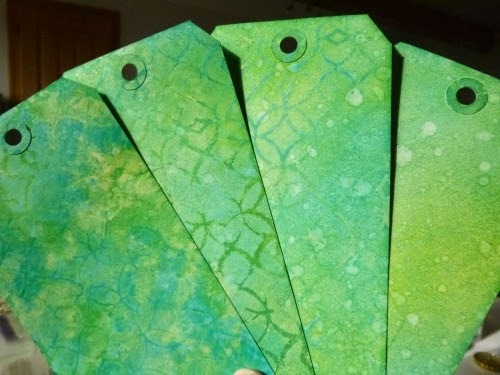 ... building up areas of colour gradually on all four tags. 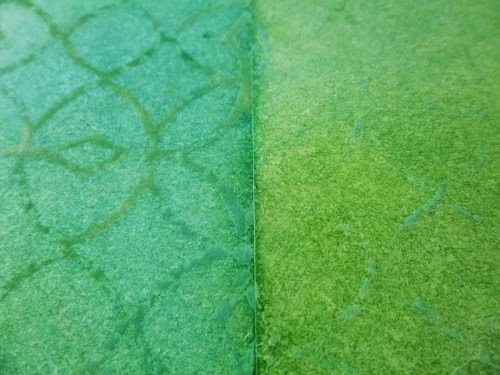 And here you start to see the fun of the contrast between the opaque paints and the translucent inks. Even though they're the same shades, the effect is quite different, and light plays off them differently. 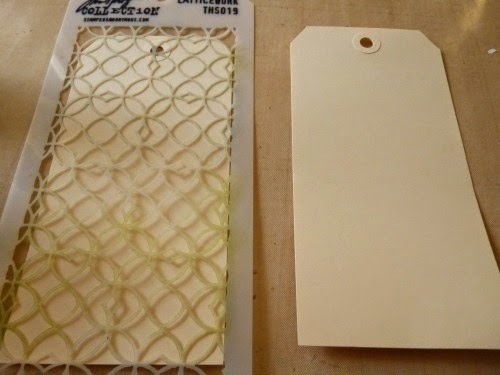 So on the very first tag, there's a lot of opacity and just hints of ink, all the way through to the last tag which is basically translucent with hints of opaque resist from the paint. The final step in this little game is to do some spritzing and flicking with water. Let the droplets sit there for a moment and then use paper towel to lift them off, and dry again with a heat tool. 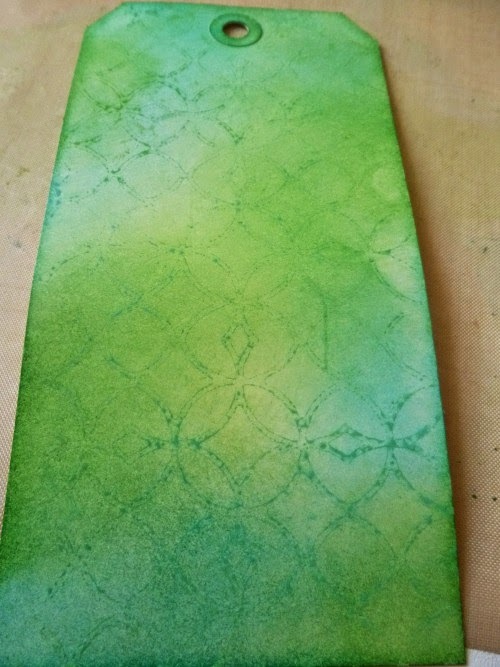 As Tim himself has shown, you get a great effect: the paint stays put underneath but the ink, being water-reactive, will shift and lift, so you get a great layered textured look. 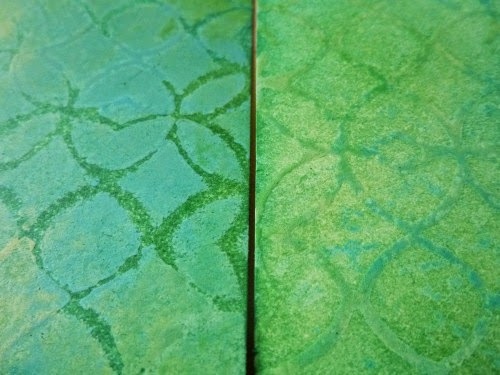 So I now have four tag backgrounds to play with - each with different amounts of opacity and translucence. I think my favourites are the middle two - with a fairly even balance between paints and inks (one from the first pair, one from the second), but all of them have possibilities. 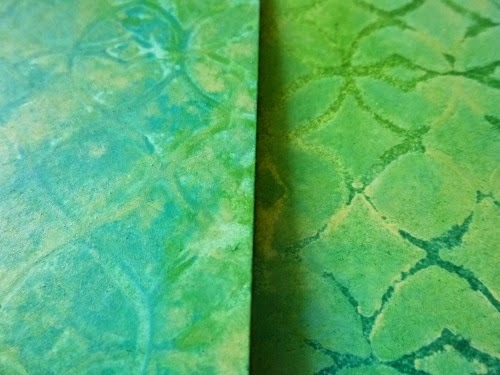 I hope that offers some inspiration for the fun to be had with the opaque Distress Paints and translucent Distress Inks. Remember, even when it goes "wrong", you can embrace that imperfection, even if only as a lesson to try it differently next time! Great tutorial Alison and some fun results. As others have said, super tutorial this, with great step by step photos too. Loved following your process and the results are really fabulous on all of them. So now I also look forward to how those are going to be finished! Like Jenny, can't wait to get my paints out too to start playing. Thanks for the inspiration! Excellent tutorial to inspire us to get out our paints and inks. I just love the varying effects achieved with Tim's techniques and of course the possibilities in 'embracing imperfections'. As a beginner to all this, though I've watched and learned from many of the commenters as well as yourself, this was a fabulous tutorial. Very well done indeed. Thank you so much for sharing your experience and craft. Thanks for this great tutorial! 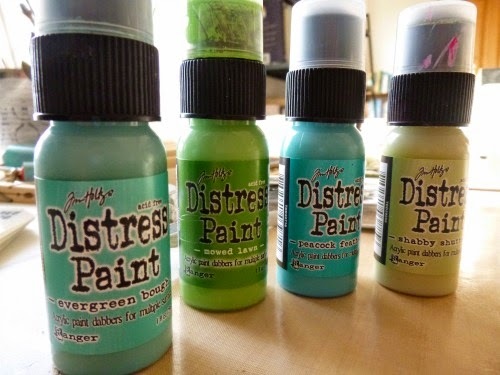 I love combining Distress paint and Distress ink. But, you've given me some great tips and I can't wait to make some backgrounds! Great job Alison - even though I use these products all the time - there is always something to be learned. Thanks for sharing these great tips. Nothing like learning from the masters. Fantastic end result, dear Alison. Wonderful play with the colours, and so different ,all. Thank you so much for your show and tell, I love your tags, and can`t wait to see next step with them ! Fab refresher, Alison! Love TH's paint and inks. Thanks for sharing this wonderful tutorial. Looks quite fun! 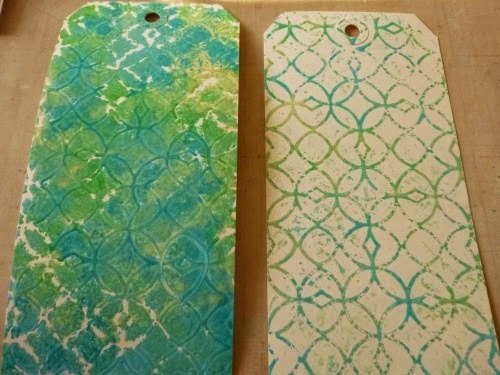 A fab tutorial Alison :-) as mentioned we can all learn from one another and it's great to see the two tags just by flipping the stencil over. This was a great tutorial. Wonderful photos--really show the differences in the 4 tags! Very interesting. I'll keep this to refer back to. Thank you. thanks for the tutorial with so many options and pictures - well done. Creative Guides... a little extra!